Introducing the ox 5 hub blind from Barronett. Featuring oxhide fabric, a unique 2-layer bonded fabric unlike anything ever used on a portable ground blind. Oxhide maximizes concealment on the exterior with a soft, no-shine, and color rich camouflage layer, that is permanently bonded to an ultra-durable, waterproof, woven polyester interior layer which is the ultimate in durability. In addition, the black interior fabric layer creates a dull black backdrop to conceal movement that will never scratch, crack or Flake off. 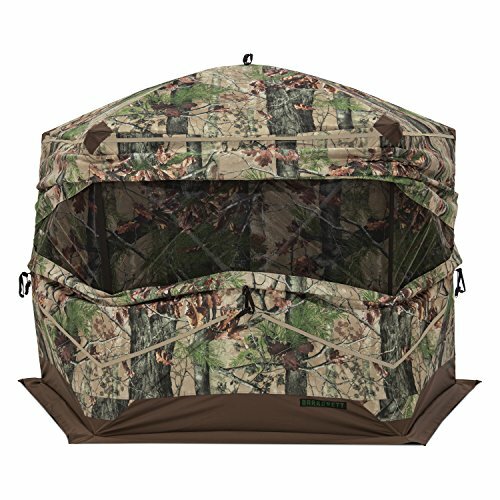 The ox 5 is a five-sided blind that has a deceptively large interior giving the Hunter a panoramic view and enough room to stay far away from window openings to keep movement concealed. The all-new fully adjustable window design opens from the center horizontally across 3 sides and silently slides to the desired width or height.